Joan's Blog: First Foodie Pen Pal Package! My sister, who is a far more experienced and professional blogger than I, runs the UK's Foodie Pen Pals scheme (FPP for short), which she found via The Lean Green Bean, a fabulous foodie blog from Across The Pond. The basic idea is this: everyone involved gets a different penpal each month. Penpals don't send to each other, so the person you're sending to is not the person sending to you. With me so far? 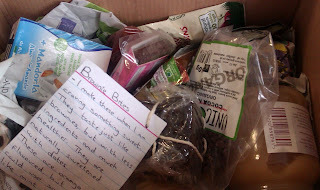 You send your penpal a 'thoughtful, food-related parcel' containing any mix of foodie delights you like, eg home baking, local or unusual sweeties, mad crisp flavours, alternative foods and so on. You also send something hand written, like a note explaining the contents, a recipe card, whatever. There's more to it, but you just need to click on the link above or on the right to find out more. Now, I will admit that I'm a sceptic when it comes to health foods. I love, love, LOVE my sweets and treats and I have the true glutton's deeply-rooted suspicion of anything not bursting with sugars, calories and atery-clogging saturates. Sweets and treats, after all, aren't meant to be good for you, right? Enough of the hippy dippy nonsense, bring on the fat grams! However, FPP is designed to introduce you to different ways of thinking about food, different types of food, different ways of meeting it, treating it, and most of all eating it. So here is my parcel as it looked when I first opened it. Full of potential, full of interesting shapes, colours and smells. And it's living up to that potential. Dannii's letter explained that she had chosen some unusual goodies from her favourite health food shop - Unicorn in Manchester - for me to try. 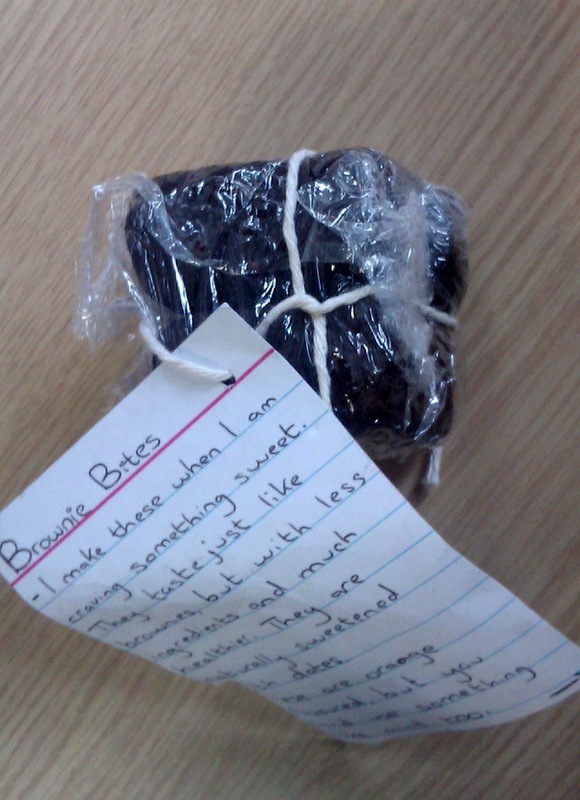 But she had also included a little treat of her own making: raw brownies. Not raw brownies as you or I would make them; that would have been horrendously messy apart from anything else, but brownies made from raw foods like almonds, dates, cocoa all ground up and smooshed up together to make little sticky, sweet, intensely-chocolatey-flavoured blocks of yum. The taste is a little surprising to those of us more used to the traditional variety, being extremely cocoa-ey, but it is really, really delicious once your head stops sending 'traditional brownie' messages to your taste buds, and it's incredibly more-ish, particularly if you're a fan of dark chocolate. I happen to love dark chocolate, so these little bites suit me right down to the ground. And the great thing is they're so intense that one teeny one keeps you going for aaaaaaages. Aaaaaaaaaages. Next up, Unicorn's own range of goodies. 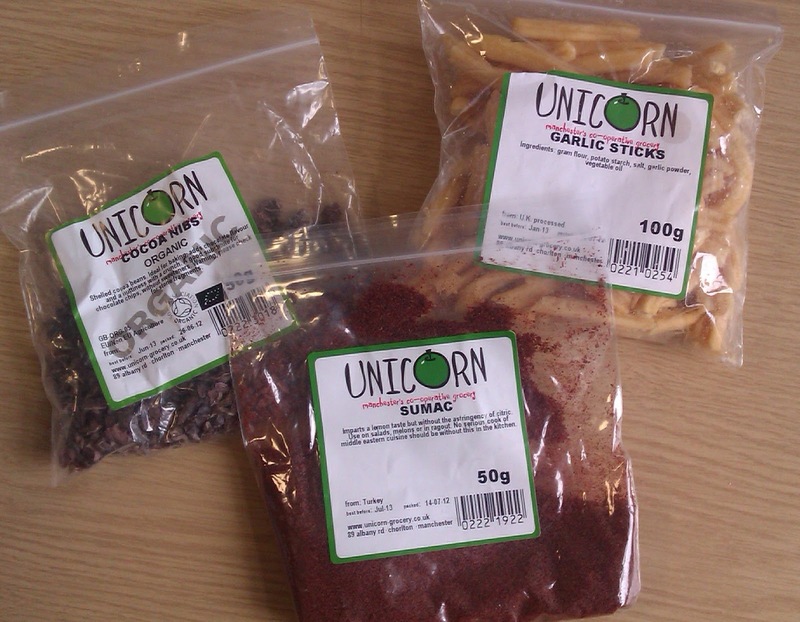 We've got cocoa nibs, garlic sticks and sumac, which is a spice I've never used before. It's lightly lemony, so I tried some on grilled salmon. The taste is less intense than I expected - from the colour you expect something with the strength of chilli or paprika, but it's very, very subtle. It went well with the fish, though. I'll definitely use it again, and next time I won't be so tentative with it. Cocoa nibs, Dannii tells me, are great for baking because while you can munch on chocolate chips as much as you like, you can't do that with cocoa nibs, you have to cook them first. Excellent idea for preventing that desperate late-night 'I....must...have..chocolate...' snack attack that can strike even the most iron-willed healthy eater from time to time. You know the one, when you will, cheerfully and without shame, rummage through the rubbish bin for a chocolate wrapper you're sure there's still some chocolate on... No? Just me then. Hmm. Anyway, I'm looking forward to trying them and will let you know how it goes in future updates. I was a little apprehensive about the garlic sticks, fearing they might be a bit overwhelming. But no. They were absolutely delicious. Crunchy and satisfying, with just the right amount of garlic seasoning. They are long gone. Looooooong gone. Finally, there were some cherry raisins; a mint raw brownie bar; a jar of apple purée; a dinky wee carton of almond milk; a pot of apple and blueberry purée and a raspberry brownie bar. This woman, by her own admission, loves brownies. Being similarly inclined, I naturally consumed the raspberry brownie almost immediately. It was good, but not as good as Dannii's home made variety - the texture was much drier - but the flavour was very nice. I've had cherry raisins before, and I had a sneaky feeling they might go rather nicely with Dannii's brownies. And they do. Oh, they do. I'll be using them again, either in my own version of brownies, or in some kind of mash-up of Dannii's recipe, which you can find here. I'm also looking forward to finding out more about baking with the apple purée, which Dannii says can be used in place of butter or oil. Hmm. Should be interesting. So, have I changed my mind? Will I be converting from Star Bars and Walker's crisps to health food options? Well, no. Like I said, I love my treats. But, perhaps, I will experiment with some of the ideas Dannii has given me, and make the occasional substitution. Every little helps, right? Want to know what I sent? Check out 2 Weddings, 1 Bride - the link is on the right. I really did love your brownies. 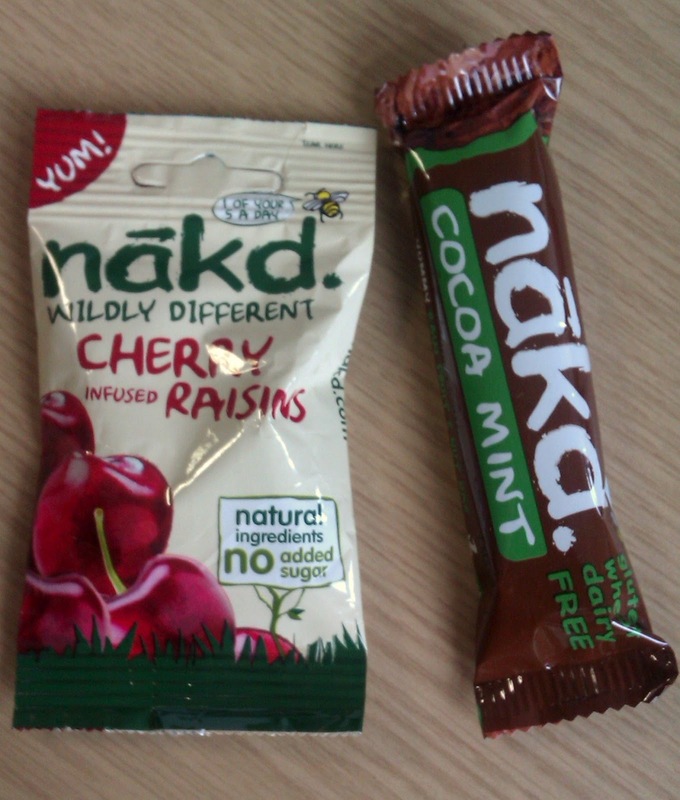 Will definitely be attempting my own version with the cherry raisins, those flavours were amazing together. 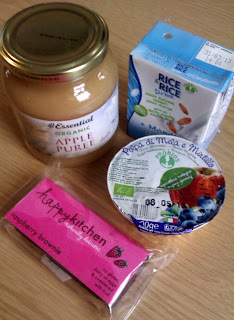 Am also going to make pancakes to have the apple and blueberry puree with. The proper kind, not the rubbish 'crepe' kind. 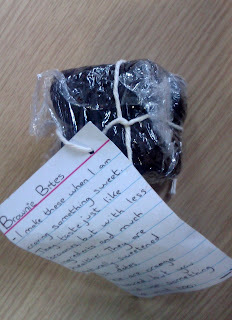 Thanks again for a top parcel, Dannii!